Major & Mrs William Jones of Old Orchard Beach started the Foundation, “The Open Door Of Hope” that feeds 100,000 children every month. There are 6 million children under the age of 5 who die every year of hunger related diseases, says Major Jones. Something had to be done to change this. We began looking for a way to do whatever we could to turn around and find a way to provide food. We knew that regular food, like we get at McDonald’s or cook at home was not going to help. Children who are suffering from malnutrition are not able to digest regular food. They need something that their system can digest and that also is nutritional. One of the products we found, Jones reports, is a “Meal Pack” which is designed to be mixed with plain water and given to people who are starving. The ingredients of the Meal Pack are oat flour, sugar, non-fat dry milk, non-dairy creamer, salt and vitamin/mineral mix which includes: vitamin A Palmitrate; ascorbic acid; thiamine; mono-nitrate; riboflavin; niacinamide; cholecalciferol; di-alpha-tocopheryl acetate; pyridoxine-hydrochloride; folic acid; cyanocobalamin; biotin; potassium iodine; zinc oxide; reduced iron; copper gluconate; calcium d-pantothenate. The Company producing the Meal Pack is Xango LLC. They have partnered with AmeriCares, a non-profit disaster relief and humanitarian aid organization who provide immediate response to emergency and medical needs as well as supporting long-term humanitarian assistance programs for all people around the world. The World Health Organization estimates that 1/3 of the world’s population, over 2 billion people lacks access to essential medicines. Since their founding in 1982, AmeriCares has provided over $11 billion in aid to 164 countries. Through our partnership with AmeriCares, Cango has supported feeding programs through the distribution of Xango Meal Packs in 20 countries across the globe. My whole life with The Salvation Army was dedicated to helping people who were unable to help themselves. We saw that by joining Xango as an independent distributor we could build a team of ordinary people who could provide these Meal Packs and be a part of the solution to World Hunger. As a member of Xango, we have built a Team of over 3000 people who are now providing 100,000 meals every month. Our income from this business has enabled us to form a Foundation, “The Open Door of Hope.” The interest from this foundation is paying to have water wells drilled every month in Villages where they do not have clean drinking water. We work through a company that hires the people in these villages to drill for the water and build the wells. In this way, the men and women of the Village can earn income for their families and provide water for their families when the Well is finished. Our Foundation also provides monthly donations for The Salvation Army Missionary work in third world countries. That is amazing what your Team has been able to accomplish said our reporter. For any team of people to accomplish this they need a good leader. As the leader of your Team tell us about yourself, your background, training, education; how are you able to do this? Well, I am just an ordinary guy, the 3rd oldest of 12 children. My parents had 9 boys and 3 girls. My Dad kidded with folks that he had his own baseball team with 3 cheer leaders. As you can imagine a family this size was faced with quite a few challenges. My Dad always had at least 2 jobs and sometimes 3. We didn’t have lots of extras, but we always had food on the table and a roof over our heads. We lived in a 5 room rented house, 3 bedrooms – one for the girls, one for the boys and one for our parents. Meal times kind of ate in shifts. By the time the younger ones were born the 2 oldest boys were out of the house, one to the Navy and the other married. We learned some good lessons about sharing and gratitude and making do with what we had. We attended The Salvation Army church and when I was 21 I heard the Call of God to study for Ministry as an Officer of The Salvation Army. I have had people question me about “hearing” God. Did I hear some voice coming out of the clouds? No, that’s not how God speaks. The “voice” of God first came by reading and studying the Bible and listening to my Salvation Army Officer Pastor teach and preach from the pulpit. Also listening to Gospel music and observing the beauty of nature – the handiwork of God. Within me I began to be aware of the Presence of God and a sense of the needs of the world around me to hear about God and His message of Hope and Love. Within me, in my heart (not the physical organ that pumps blood through my body), but in my inner being – who “I” am, I knew God wanted me to offer myself to be His servant. I applied to attend The Salvation Army Officers Training College in the Servants of Christ Session and was commissioned as a Lieutenant in The Salvation Army in 1963. Thus began my journey in ministry. In 1968 I met and married my wife Sandie and she joined me by going through the same training program and became a commissioned Officer of The Salvation Army. Most people don’t know that The Salvation Army is a church as well as a social service organization. My wife, Sandie and I served as Pastors for 12 years and then specialized in ministry as administrators of The Salvation Army Adult Rehabilitation Center in a number locations for 28 years. These are residential programs for men and women with alcohol and drug addictions. We Praise God for the number of men and women who experienced God’s redeeming power through those years. In retirement we went from a position of security and responsibility to a position of a fixed income vs. rising expenses and no longer having a platform of offering hope to those who feel hopeless. When we started a home based business with Xango, one of the wonderful things we experienced is to give us back a sense of purpose and significance. We spent our first career with The Salvation Army in service to God and people. What a joy it is to once again have a platform to present hope and help to hundreds of people. There are so many people out there who feel hopeless about their future, economically, health wise and in the area of significance. We have a message of Hope for our business partners and for the thousands of people whose lives are being touched by The Open Door Of Hope Foundation. Personally, we have grown so much in our own lives about the law of Sowing and Reaping – Giving and Receiving. We have received far more than we have given. Our life is so blessed by God. No matter how much we gave of ourselves, we always received more in return; you cannot out give God! 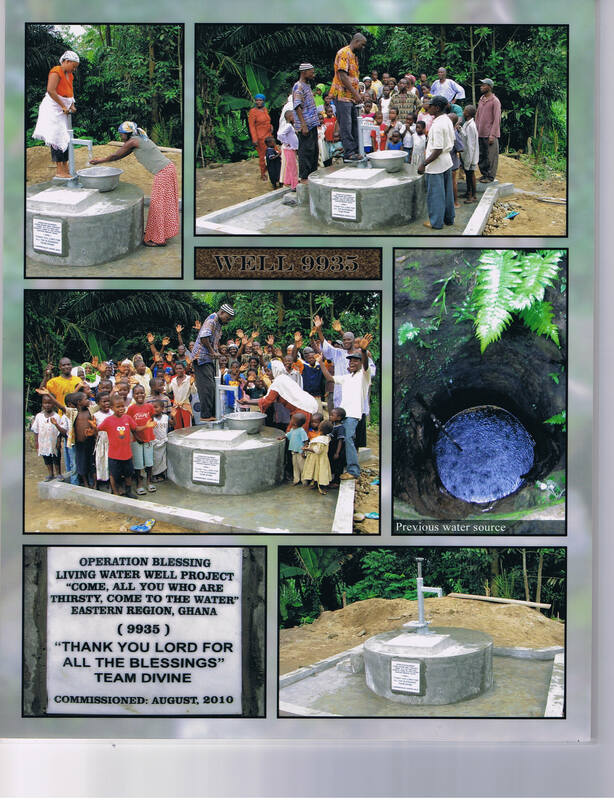 This is a picture of the water well in Ghana our Team has provided. I feel your success in reading this press release. Helping those who can not help themselves, feeding the hungry, and providing a well of fresh clearn water is no small thing. Well done. Thank you for sharing.